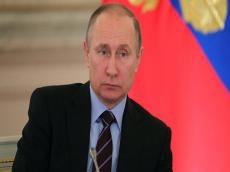 Russian President Vladimir Putin has sent a congratulatory letter to Kazakh President Nursultan Nazarbayev on the occasion of his birthday, RIA Novosti news agency reported citing the statement of the Kremlin press service. In his letter, Putin expressed confidence in the further strengthening of the alliance and strategic partnership between Moscow and Astana, according to the statement. “Putin highly appreciated kind and friendly relations established with Nazarbayev and expressed confidence in the expansion of productive cooperation between the two countries within the Eurasian Economic Union, the Collective Security Treaty Organization, the Shanghai Cooperation Organization, the CIS and other multilateral structures in the interests of the fraternal peoples of Russia and Kazakhstan,” the statement said. Putin also noted that many years of Nazarbayev’s activity at the presidential post earned him respect of the Kazakh citizens and high international prestige. “The ideas of the Eurasian integration formulated by you are being consistently implemented, contributing to the social and economic development of our countries, ensuring stability and security on the continent,” says the statement.